Last week, we posted John Parr's new song, "Tim Tebow's Fire," a reworking of his "St. Elmo's Fire (Man In Motion)" with a new subject: Denver Broncos QB Tim Tebow. 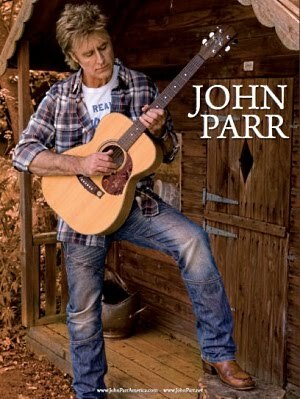 John Parr was nice enough to talk with us about the song, Tim Tebow, his tour, and his upcoming appearance in American Anthems. What made you redo your '80s hit "St. Elmo's Fire (Man in Motion)" as a tribute to Tim Tebow? Are you a big fan of his? I was up at ESPN to pitch a song I had written for Monday Night Football. It was the day that Tim was announced as the starting quarterback for the Denver Broncos. They asked if I would play "St Elmo's Fire" on the SportsNation show. Just minutes before we went live, they threw me a Tebow jersey and said, "Would you wear this?" I said, "Sure" and off we went live. I noticed they were running video of Tim Tebow behind me so at the end of the chorus I sang, "Tim Tebow's fire." The studio went crazy and everybody came on the floor and sang. A few weeks later, they asked me if I would do a studio version so that [ESPN] could make a short Time Life-type film of Tim's story, both past and present. I liked the idea so rather than tamper with the original, I recorded the track from scratch. Once I shared it with a couple of people, it just caught fire. In terms of motivation, "St Elmo's Fire" was originally written about wheelchair athlete Rick Hansen, who was just beginning his attempt to circumnavigate the globe in his chair on the Man In Motion World Tour. The song helped raise awareness of Rick and went number 1 in almost every country he wheeled through. This year sees the 25th anniversary of his successful completion and the foundation has raised in excess of $250,000,000 for spinal research. Watching Tim on and off the field, I found him inspiring. A maverick, unafraid to go his own way. A man who believes in something in a world where few of us believe in anything. In truth, that's why I went the extra mile and rerecorded the song. Tim also has a foundation dedicated to helping children. I have written a new song "Just A Man" as a personal anthem for Tim in the genuine hope that we raise funds for this wonderful cause. What has been the reaction to the song so far? Have you received any negative feedback regarding the remake? There are people out there who carve their name on a tree to say "I was here." I would rather plant one. Why do you think Tim Tebow's such a polarizing figure? He is the embodiment of Rocky, that never say die spirit. Knock him down and he gets up again. The past four weeks are a testament to his character. A month ago the media were saying, "He's terrible." The following week, "He's great." And now he's back down at the bottom. Yes, he and the Broncos came undone against a superior team. But Tim and the team will learn and improve from it. As a quarterback, I love the fact that he goes where he is not supposed to: into danger. Risking all for the team. As a man, he is a true believer and unafraid to show it. I am not talking about his religious belief; just the fact that he has faith in something. Outside of our families, how many of us can say that? On your last tour, you played clubs, bars, high school auditoriums, an Air Force base, a Marine Corps base, and Charlotte Motor Speedway. What was it like playing so many different kinds of venues? Since I was eight years old, I have played everywhere and anywhere. I used to love playing rock clubs with the crowd right in my face. These days I prefer theatre venues, small and intimate. My work for military and their families has seen me in aircraft hangers, troop canteens, even football fields. I have been doing it so long I just adapt. The main thing is trying to connect with people and sometimes the venue can make it a real challenge. How did the tour go? Did you have a favorite show? The tour is ongoing. We are doing all kinds of shows in 2012 but my main thrust is for the military and their families with an album I am recording to mark their dedication and sacrifices. My favorite show so far was Seymour Johnson Air Force Base Christmas show. I wrote a new song for that event, "Across The Open Sky," a tribute to American Airmen and women and what they stand for. You're getting ready to appear in American Anthems, a touring UK musical. Can you tell us a little about the story? It's a review show featuring the classic American songs of the '80s. The premise is a search for a rock star who was big back then but has disappeared off the radar. They eventually find him and put him on stage at Madison Square Garden for a triumphant comeback show. Ring any bells? What role will you be playing? Have you done musical theater before? I appeared in Paris, the rock opera. That was a while ago but it had a wonderful cast that included the late great Harry Nilsson. My role in American Anthems will be The Rockstar. Typecast as usual. What else do you have planned for 2012? I return to America to play a series of sporting events: NASCAR, NBA and of course my military shows. My first date is recording with the 82nd Airborne chorus. It's a song I have specially written called "Bound By The Thread Of The Flag."